This entry was posted on Monday, July 5th, 2010 at 6:19 pmand is filed under . You can follow any responses to this entry through the RSS 2.0 feed. You can leave a response, or trackback from your own site. how do you grill these? is it just a regular old backyard grill? yay for starting a blog…you inspire me! Carrie, thank you! I use a pizza stone on our gas grill, on high for about 10 minutes give or take. The stuffed squash blossoms remind me of two recipes from my childhood – Mexican squash blossom soup, and stuffed blossoms (stuffed with cheese and covered in batter and fried. served with a red tomato sauce over them). Unfortunately I don’t have the recipes but I’ll see if I can get them. That pizza sounds delicious. 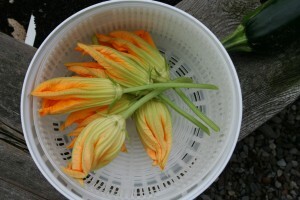 I love stuffed, batter-fried squash blossoms, I make them too! Thank you so much 🙂 It’s rewarding to know you enjoy reading it.